There is perhaps no greater sign of how broken humanity’s relationship with the planet is than our food system. Carbon pollution from farming is running rampant, water resources are being depleted at an alarming rate, and obesity and starvation are simultaneously putting millions at risk. A recent report put out by the EAT-Lancet Commission lays out how we may have to change our diets to accommodate another 2.5 billion souls and a hotter Earth. With that in mind, I’ll be our futuristic guinea pig and will be documenting my experience not as some holier-than-thou crusade but as an attempt to understand what eating could be like in a more sustainable future – easy, difficult, cheap, expensive, tasty or bland. I’ll get a hand from Claire Lower over at Skillet. She’ll be sending me some recipes in line with the diet’s suggestions, which are an attempt to maintain the health of humanity and the planet we call home. “We’re very much off track to do that at the moment from a health standpoint as well as a climate change standpoint,” Walter Willett, the report’s lead author and a physician at Harvard, told Gizmodo. The report outlines what a “planetary health plate” looks like on a daily basis. Despite what you’ve heard about the future of food being lab grown meat, crickets, and earthworms, the plate’s contents will look pretty familiar. It consists of about 50 percent fruits and vegetables and in descending order, portions of whole grains, plant protein, unsaturated plant fats, dairy, animal protein, sugars, and starchy vegetables. The planetary health plate is meant to address two huge issues. The first is climate change. The food system emits anywhere from 19-29 percent of all global greenhouse gases. Some of that comes from fertilizers and land clearing, both of which also contribute to local environmental degradation. But the most problematic facet of our food system from a climate perspective is raising livestock, particularly cows and their unfortunate habit of methane-laden burps. Mounting evidence suggests red meat and particularly processed red meat is bad for your health in quantities Americans eat it at, which gets at the second issue the planetary health plate tries to address: human health. Americans over-consume a lot of bad food while other parts of the world don’t get enough food, period. Both can lead to serious problems, and trying to get everyone’s diet closer to the planetary plate could prevent roughly 11 million deaths annually. I asked Willett for advice, including the whole meat eating thing which I occasionally indulge in. The diet allows for 14 grams of red meat a day, which isn’t even enough to make a White Castle slider. Willett suggested I could save up that daily allowance, which would net me a quarter pounder by week’s end or a “big juicy steak” by month’s end. I also asked if I should aspire to eat locally. He said the type of food was more important than distance my dinner travelled. There have already been some critiques of this diet. Chief among them is that the diet resembles the Mediterranean diet and some findings about its healthful benefits have recently come under fire. There’s also the fact that a one size diet can’t fit all – individuals inevitably have different needs and tastes. Ditto for different cultures and how they relate to food and eating animals, which the researchers acknowledge must be “carefully considered in each context and within local and regional realities.” And carbon emissions aside, the researchers acknowledge the diet wouldn’t be enough to fix other issues with agriculture including overuse of fertiliser, mismanaged cropland and water resources, and biodiversity loss. All that said, we’ll have to be aspirational if we want to keep the Earth from becoming an even hotter mess. 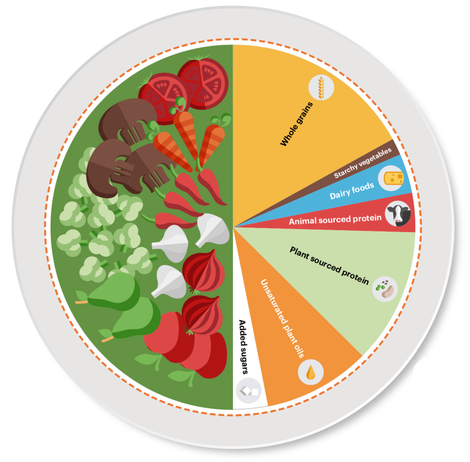 So I’ll be giving the planetary health plate a go. Stay tuned for updates and recipes from the future.